Jazz pianist Kálmán Oláh, a native of Hungary, has gained international reputation as an artist who masterfully combines the elements of jazz, folk and contemporary classical music. He is the recipient of numerous awards, including the Grand Prize of the 2006 Thelonious Monk International Jazz Composers Competition. Renowned for his distinctive compositional style and his original approach to playing jazz, Kálmán has appeared with scores of well-known artists including Lee Konitz, Randy Brecker, Steve Grossman, Jack DeJohnette, John Patitucci, Tommy Campbell, Ron McClure, Stefano Di Battista, Philip Catherine, Palle Danielsson, André Ceccarelli, Paolo Fresu, Kenny Wheeler and Ravi Coltrane, to name a few. Born in Budapest in 1970 of Romany parentage, Kálmán began playing classical piano at the age of seven and began composing at the age of 17. He completed his studies at the jazz faculty of the Béla Bartók Conservatory and the Franz Liszt Academy of Music. His unique voice earned him an early recognition and throughout his student years he played with different formations, including Tony Lakatos and the László Attila Band. In 1990, Kálmán established Trio Midnight, an innovative jazz trio that helped him to earn recognition and made him a regular at such prestigious events as the Umbria Jazz Festival in Italy, the Getxo Jazz Festival in Spain and the Ciney Jazz Nights in Belgium. In 1994, inviting leading Hungarian jazz musicians, he founded the Kálmán Oláh Sextet and next year they scored a great success at Marciac Jazz Festival in France. While the Sextet mainly played mainstream jazz in its early years, it soon developed its unique style of modern jazz based on the compositional music of the 20th century, especially the rich tonality and polymodal chromaticism of Bartók. Kálmán is a regular guest either as a soloist or in different international formations and has performed at prestigious festivals in Europe and Asia, including the London Jazz Festival, Grey Cat festival, Siena Jazz in Italy, Jazz Baltica, or the Solo Piano Festival in Prague. Kálmán has won numerous awards including the Jury Prize at the Leverkusen International Jazz Competition in 1990, the Grand Prize at the Kalis International Jazz Pianist Competition in Poland in 1991, and the "Best Jazz Soloist of the Year" title of the Hungarian Radio in 1995. He was voted "Best Soloist" at the Hoeilaart Jazz Competition and was a prize winner at the Great American Jazz Piano Competition in Jacksonville, Florida in 1995. In 2001, he received the prestigious "Hungarian Jazz Prize" from Gramofon Magazine, a leading jazz and classical music publication in Hungary. In 2000, Kálmán became a member of the Jazz Faculty at the Franz Liszt Academy of Music in Budapest, where he teaches the piano and composition. He has also led various composition and big band workshops at the Berlin Jazz Institut. As a composer, Kálmán has played and recorded his original music ever since his first album. His compositions fuse jazz and contemporary classical music with Hungarian folk. Kálmán's critically acclaimed Concerto for Jazz Orchestra was performed in February 2001 at the Hungarian Radio with the Budapest Jazz Orchestra. In 2004, "Concerto for Symphony Orchestra and Jazz Band," an arrangement of the Concerto for a symphony orchestra was performed with the participation of the Miskolc Symphony Orchestra. The Concerto reflects Kálmán's devotion to contemporary music, and it was labeled as "a truly original composition," and a "unique and fresh re-interpretation of a melodic and harmonic world that was created by Bartók and Stravinsky." In 2001, Kálmán worked in co-operation with the Stuttgart Chamber Orchestra for the Korean label Good International Co. on a special cross-over project: a rendition of Bach's Goldberg Variations with Kálmán's improvisations over Bach's original themes. This record was followed by two more releases by the same label: Sketches from Bach’s Cello Suites (2001) and Hungarian Rhapsody (2002). 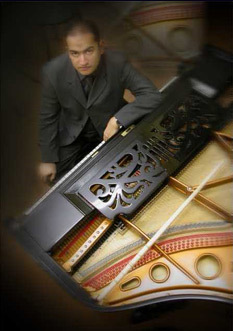 Kálmán's 2003 trio record, "Contrasts and Parallels," offers a unique experience of improvisations over Bach's original themes that are contrasted by a series of variations on a Hungarian folk song; this record was published by the Japanese label, MA Recordings. In 2006, Kálmán received the Liszt Award, the most prestigious music award given by the Hungarian Government. In 2007, he was honoured with the Gábor Szabó Prize by the Hungarian Jazz Federation for his achievements in music. 1995 eMeRTon (Hungarian Radio) award "The Best Soloist of the Year"